Recently a few of my friends have experienced the loss of a loved one. I have been going through my own sort of grief as well. We have been living in the time of Gemini. The 9 of Swords covers the mid-section of the sign (June 1 – 10) and holds the energy of guilt, emotional torment and sorrow. This card is followed up by the 10 of Swords (June 11 – 20), and it represents a collapse of plans, a sense of suffering and powerlessness. 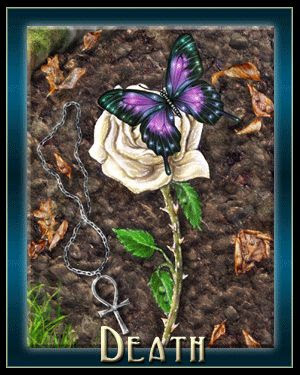 “Death is also known as Transition in certain modern tarot decks. Transition is a great change or passage that brings growth by moving from one state/condition to another. Death/Transition brings with it a sense of pain, or grief, as certain elements of one’s being are left behind thus making room for new things or growth. The best analogy I have is through understanding how certain reptiles, like snakes, grow. When a snake sheds its skin, it begins with a drying-out of the old skin. Everything becomes itchy and uncomfortable. Even a snake’s eyes become covered with dry skin, and for a period, they are even blind. They realize it’s time for a change, so they begin to move their bodies across rocks, plants or surfaces that can help remove the skin. This can sometimes be painful as fresh skin becomes exposed to rough surfaces. Once the skin is off, they are still fragile for a time. The new skin hasn’t quite become accustomed to the environment, so it can be tender to the touch. Once all the pain and discomfort from the shed is complete, you can see the snake has grown. Depending on the snake, it can even be many inches! When my aunt died several years back, I was asked to officiate her funeral. I spoke of her difficult life, and I likened it to a heavy coat. She went through this physical plane wearing a coat that became heavier as the burdens of her life collected and clung to her. When she passed, she was allowed to take off that heavy coat. Imagine that feeling of freedom after so much pain and suffering! Every living thing must always be growing, learning, advancing. If it’s not, then it is stagnating. Stagnation, non-movement, is not growth. Transition and death are required for that. In the case of physical death, the Divine Source that vacates the body grows by becoming a more universally-enlightened energy. When we experience the death of a loved one, we move through our own transition where we must let go of the physical person (or even a pet). We grieve at the loss. For a time we may be blind to anything but our own emotional-discomfort. After a period, we learn to live differently – without that person (or pet) in our physical life. It doesn’t mean they are no longer alive. They have merely moved to a life that is outside of our physical senses. Listen to your spiritual sense, and you will likely find them. Please know that this not meant to downplay the grieving associated with the death of a loved one. This is simply meant to help others through my own understanding of transition. All is done through sincere Aloha Spirit. butterfly, death, death card, grief, loss, snake shedding, tarot death, transition. Bookmark.